During his time at Monmouth, Kyle Durso '13 learned a lot about himself and his future goals. When Kyle was a freshman, he didn't know exactly what he wanted to do. Eventually, he discovered his passion for history, and now is looking forward to graduate school-hoping one day to work for the CIA or FBI. Kyle, growing up less than an hour from campus, got the opportunity to explore many different options at Monmouth. Originally a communications major, he switched to a history major during his sophomore year. 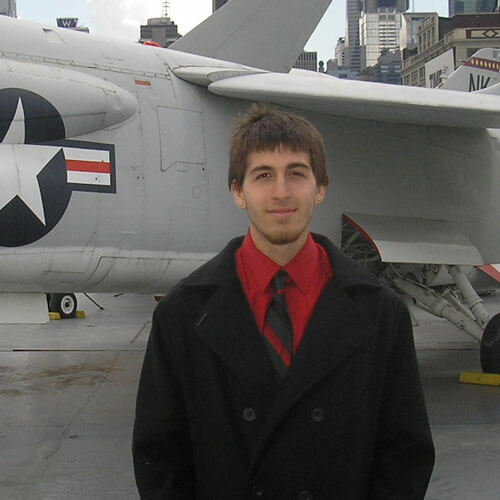 An internship-a popular way to satisfy the Experiential Education requirement at Monmouth-during his sophomore year at the Intrepid Sea, Air, and Space Museum in New York City solidified Kyle's choice of major. "I was able to live in the past and see what life was like during this time of war for the U.S. Navy," Kyle said. "As an archivist, I was able to see many parts of the ship that are not open to the public and learn more about the Intrepid's fascinating history. It was truly an amazing experience, and because of Monmouth I realized my true passion for history and pursued it." Small classes-generally less than 30 students-a great location near New York City, Philadelphia, and the Atlantic Ocean, and supportive faculty really helped Kyle thrive at Monmouth. "Being in this type of atmosphere helped me strive for excellence," Kyle said. "I was never just a number, but an actual person that my professors took interest in." Professor Brooke Nappi taught an introductory anthropology course and a class on magic, witchcraft, and religion-both were truly awe-inspiring. Learning how various cultures live and relating that to our own culture helped me value the luxuries that we take for granted and how our cultures are not so different when viewed together. Monmouth truly is an amazing school. With extremely friendly faculty and so many options for students, it's a great university. The experiences I've had at Monmouth will stay with me for the rest of my life. Monmouth has shaped me into the person I am today.